In an earlier post, I described the dubious dawn of couples therapy before John Gottman and science-based couples therapy. In this post, I hope to convey what a startling transition has been made with the advent of research-driven couples therapy. There is one man who has been at the forefront of this scientific revolution; Dr. John Gottman. Dr. John Gottman in his heart is a mathematician and “hard” scientist. He devotes his life to meticulously recorded observational data, and carefully uncovering hidden patterns of stimulus and response. He was obsessed with measuring what many of his colleagues believed at the time was not measurable. Were there predictable patterns of behavior, or sequences of interactions, that could help us fundamentally understand why some couples remained loving and connected, while others sank into misery…despite struggling with identical problems? At the time, it was not at all clear that uncovering such knowledge was even possible. Dr. Gottman and his colleagues began by developing the mathematics for sequential analysis, which has since become a mature research methodology. Systematic observation of couples was undertaken in Gottman’s lab way back in the 1970’s. His efforts were rewarded by the mental health field with bemused skepticism. Therapists at that time found it impossible to identify predictable patterns in the personality of an individual client. They found the notion of a science-based couples therapy laughable. If we could not fathom the depths of a single human soul, how could we even begin to measure intimate relationships between partners? No wonder couples therapy before Gottman had a success rate of well under 20%. Before Gottman, not only was there no science in couples therapy, the prevailing wisdom was that there would never be any science to be had. Gottman was on a fool’s errand, trying to measure the unmeasurable. 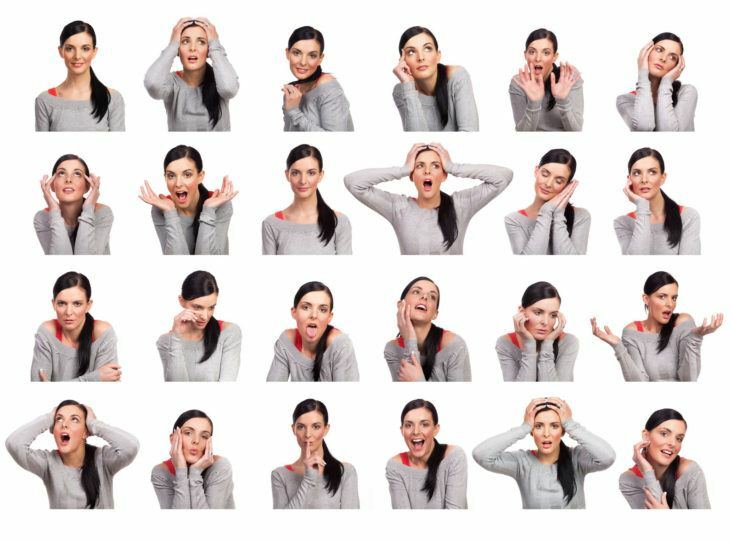 In a series of research studies, Dr. Gottman and his colleagues developed new methods for studying sequences of interaction and facial coding. 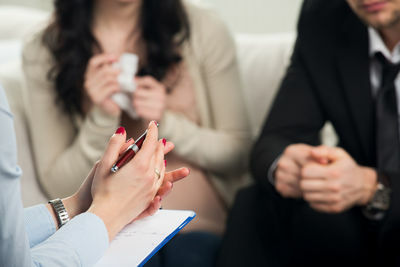 They collected data in real time, by constructing a “Talk Table.” With the new technology of the “Talk Table,” couples could describe their emotions during a conversation, and rate not only how positive or negative their intentions were, but also how positive or negative their partner’s reactions were to their conveyed message. In 1975, Robert Levenson and John Gottman analyzed emotion in a brand new way. They pioneered the use of psychophysiological measurement and a video-recall method that gave them rating dial measures of how people actually felt during an argument in real time. Gottman built on the work of Paul Ekman and Wallace Friesen, who were developing their Facial Affect Coding System (FACS). In CTI, both Dr. McMahon and Dr. Rodriguez have advanced certifications at the “expert level” in Paul Ekman’s facial recognition training.If you’ve ever seen the TV show “Lie to Me,” it is based on Dr. Ekman’s work. In 1989, Dr. Gottman ultimately developed his own technology, the Specific Affect Coding System (SPAFF). Is this data replicable? Are we on to something here? Can we measure what was commonly believed to be impossible to quantify? Can we uncover the fundamental laws of a happy marriage? One of Gottman’s most important discoveries was that the vast majority of relationship problems (69%) were utterly unsolvable. They were related to differences in families of origin, culture, personal beliefs and values, and personality. Much of Gottman’s discoveries were counter-intuitive and contradicted the then-current seat-of-the-pants couples therapy. These “Perpetual Problems” are a universal aspect of marital intimacy, and require management and attunement rather than specific solutions. Dr. Gottman’s research fascinated the press, and he came to dominate the field of couples therapy because his research was startlingly and unarguably predictive, and replicable. In fact, in seven longitudinal studies, the data held up under close scrutiny. Gottman could now predict whether or not a couple would eventually divorce with an astonishing 90% or better accuracy. He was able to stone-cold quantify what many believed was utterly unquantifiable. His research employed breakthroughs in emotional coding technologies, measuring incidents of Criticism, Defensiveness, Contempt, and Stonewalling (which Gottman called the “Four Horseman of the Marital Apocalypse“). Further metrics in physiology and a fresh approach to clinical interviews were also ground-breaking. Gottman and his research colleagues truly are the fathers of modern science-based couples therapy. In 1986, Gottman spearheaded the design and construction of an apartment laboratory at the University of Washington that was nicknamed the “Love Lab” by the press. There were mounted cameras in the common rooms, a large two-way mirror with technicians recording and coding marital interactions. “Jiggle meters” were at the bottoms of the chairs to measure physical agitation during conversations. Blood was drawn to ascertain prevailing levels of stress hormones. Gottman and his team measured everything they could. Relentlessly. Precisely. Over decades, with over 3000 couples. The “Love Lab” research famously uncovered the hidden realities of marital friendship and intimacy, and how gridlocked conflict could be constructively managed, and long-standing relational rifts healed and repaired. It took Levenson & Gottman 14 years of research, but they uncovered another more subtle dysfunctional pattern; emotional disengagement. It is characterized by a lack of positive affect while in a conflictual discussion (no curiosity, humor, repair attempts, warmth, or, most important…empathy). The uncovering of this pattern completed the clinical timeline. For the first time in the annals of social science, it was possible to predict not only the likelihood of divorce but now, most amazingly… when. Couples who had marital interactions dominated by the Four Horsemen tended to divorce an average of five and a half years after the wedding, while the newly identified emotionally disengaged couples managed to divorced more than three times later, just over 16 years after the wedding. I remember when my wife and I attended a presentation by Dr. Gottman way back in 1998. 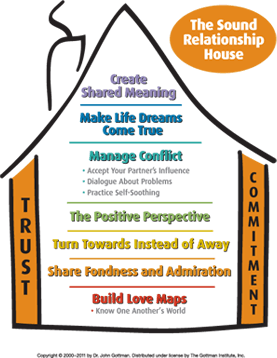 This was only four years after he began to develop with his wife, clinical psychologist Dr. Julie Schwartz-Gottman, a synthesis of decades of research culminating in their groundbreaking, Gottman Method Sound Relationship House (SRH) theory. We have been studying Gottman Theory since it was first codified 20 years ago. The Gottman Institute, founded in 1996, brings science-based clinical research and advanced certification training to couples therapists all over the world. It is an ambitious and demanding training. The Gottman Institute wants to know that couples are in good hands with you, particularly if you’re conducting an Intensive Couples Retreat. There are 6 Gottman Master Trainer/Certified Couples therapists who work at the Institute, helping to train future Gottman Therapists in science-based couples therapy. Two of those six are team members at Couples Therapy Inc. There are only about 250 Certified Gottman Couples therapists on the planet right now. Five are in our practice, and several others are on the certification track. I know of no other couples therapy clinical practice that has anywhere near as many. What does science-based couples therapy mean to the world? What does it mean to you? Science-based couples therapy is 70% to 92% effective. It can be life changing. And it’s beneficial influence on your loved ones can echo through time. The science of healing intimate bonds has never been better. We have two research-driven, evidence-based methods to heal and repair troubled marriages, Gottman and EFT. And both have advanced training institutes. There are far too many “all-purpose therapists” out there who choose to know nothing about these proven, evidence-based methods. Sadly, their ignorance often makes troubled marriages worse. Only about 10% of so-called “couples therapists” have any training in couples therapy at all. The tragedy is that only 19% of troubled couples enter couples therapy. Think of it. Only 1 in 5 couples. These are brave souls. They deserve the best chance they can get to turn things around, for themselves and for their kids. They deserve the best that science-based couples therapy can offer. Unfortunately, because 90% of all “couples therapists” have no training, they rarely have an opportunity to get it. Does Your Marriage Deserve a Science-Based Couples Retreat? Call us for more information 844-926-8753 to reach our Intake Coordinators.